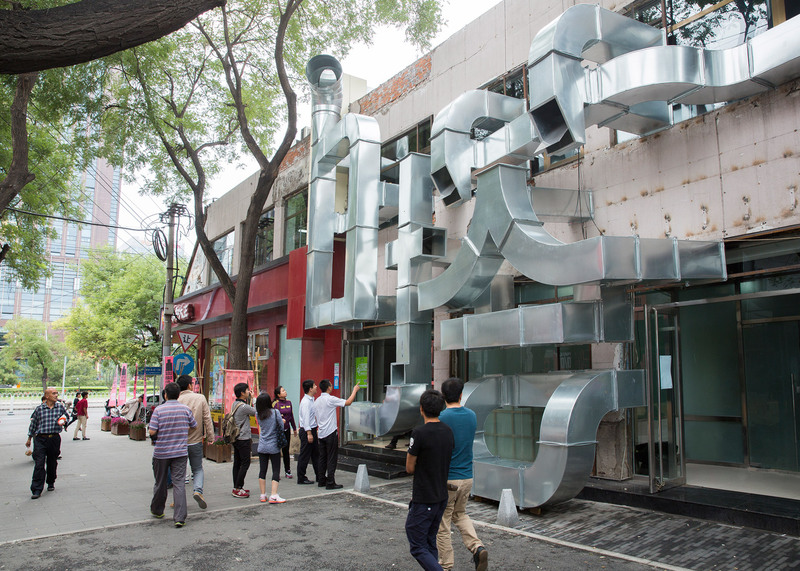 Chinese studio People's Architecture Office used metal air conditioning pipes to create giant Chinese characters on the facade of the Tubular Baitasi visitor centre during Beijing Design Week 2015. 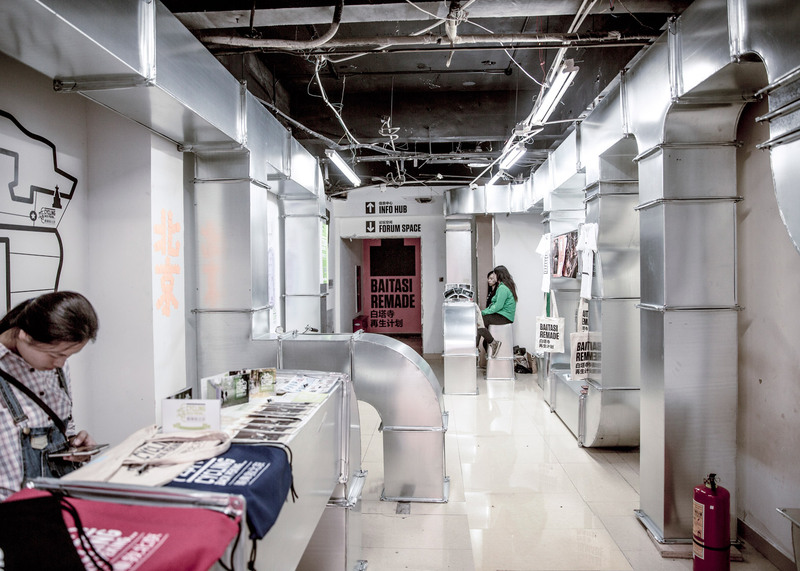 The visitor centre was established to host events and exhibitions that showcase "regeneration strategies" for Beijing's Baitasi – a cultural and historical preservation zone and hutong area within the Chinese capital. 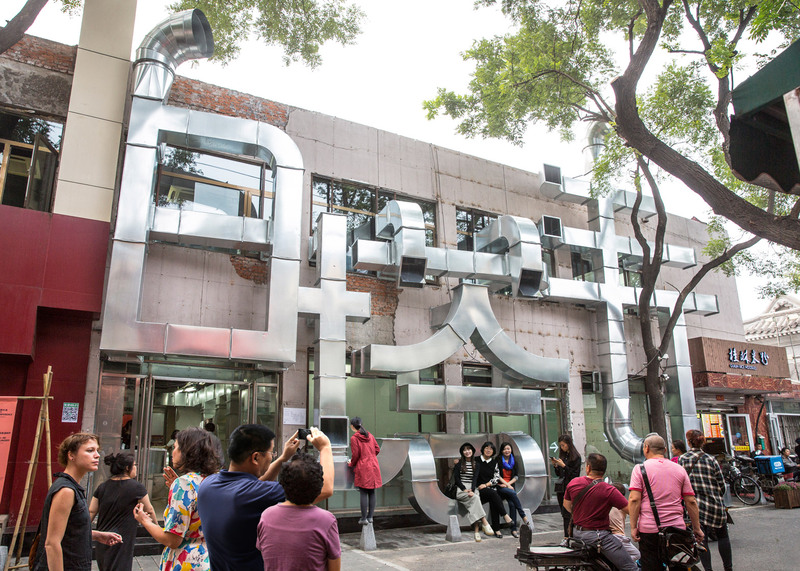 People's Architecture Office used sections of metal piping normally installed for heating, air conditioning or ventilation purposes to spell out the Chinese letters 白塔寺, meaning White Pagoda Temple, on the exterior of the building. 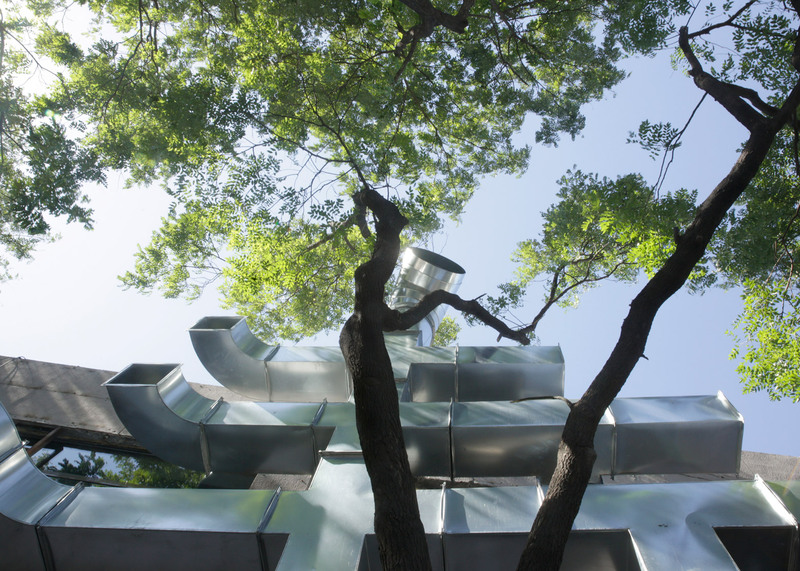 This is a reference to a nearby 700-year-old structure, which passersby can see if they peer inside sections of the piping that were purposefully left open by the architects. 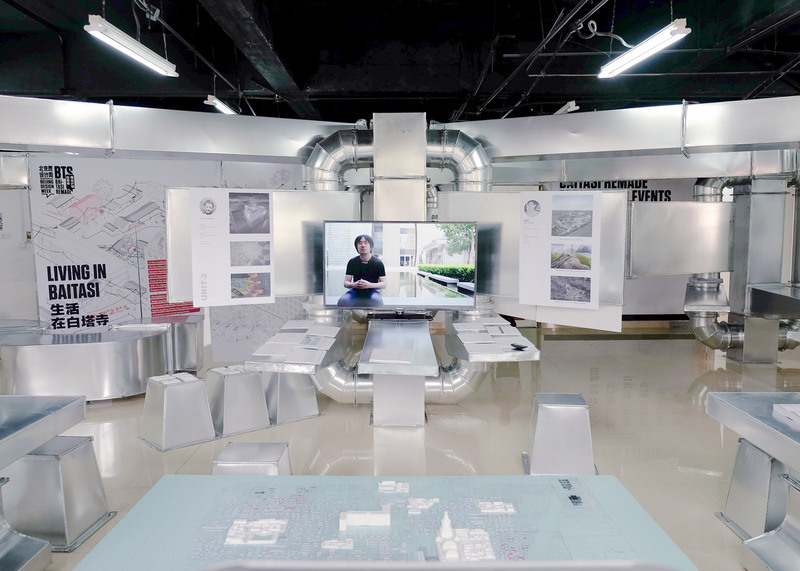 These periscope-like sections also offer views of the People's Commune Building – a 1950s experimental housing complex – as well as glimpses into the second floor of the visitor centre, which houses the Architectural Association's teaching space and a 3D-print shop. 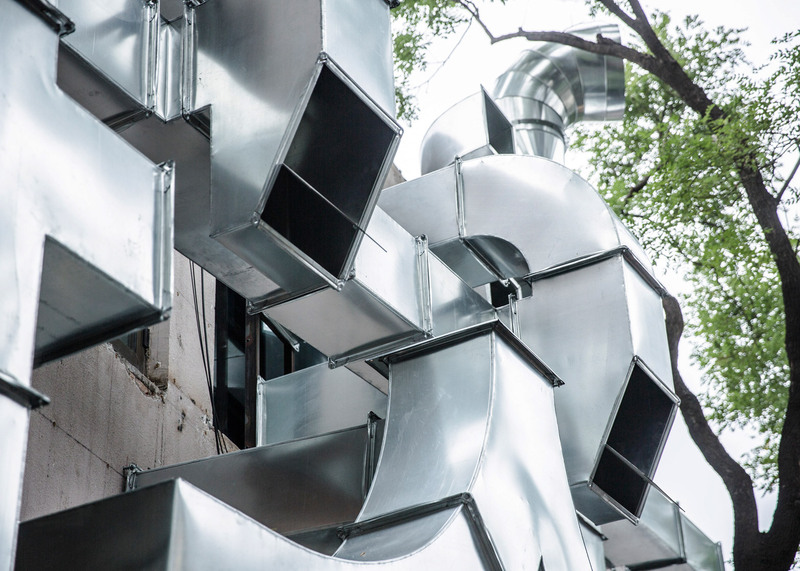 "The multi-storey building uses ubiquitous HVAC metal ducts as a type of architectural vernacular," said the architects. 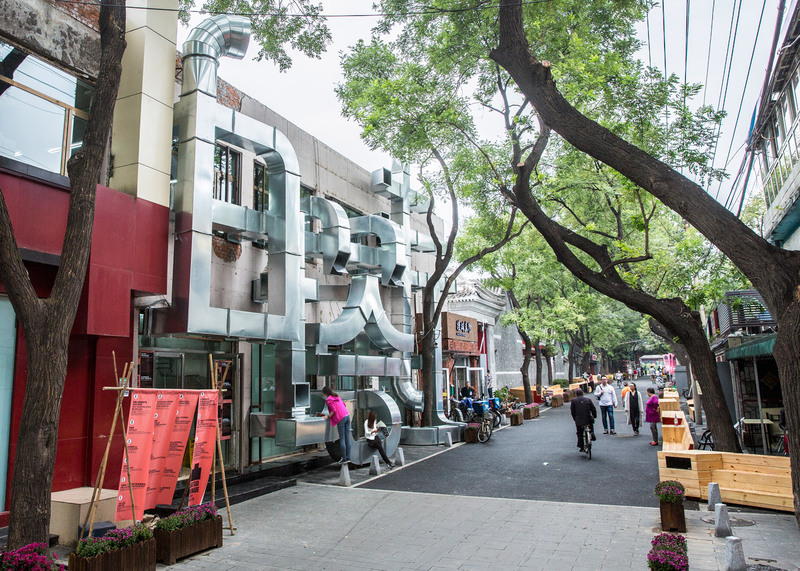 "The design of the facade aims to engage the public in various ways." 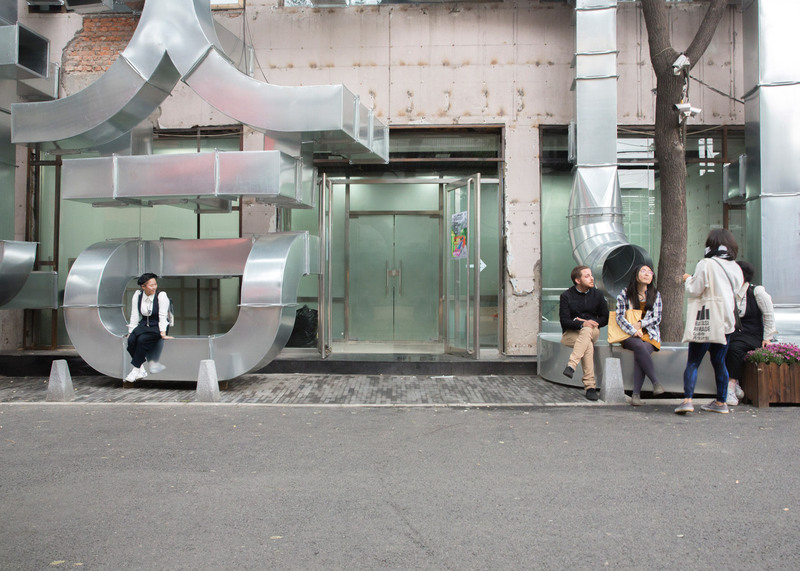 U-shaped sections of the piping extend from the building, offering seating for pedestrians to rest on. The piping continues inside the building, providing display spaces, desks and podiums for exhibition spaces. 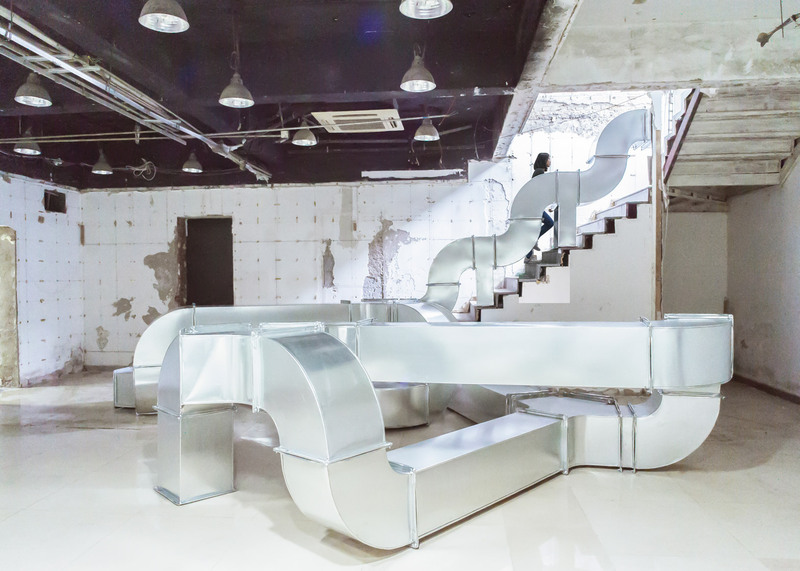 It also forms furniture for visitors, pipes extending like branches from central tables to form seats. 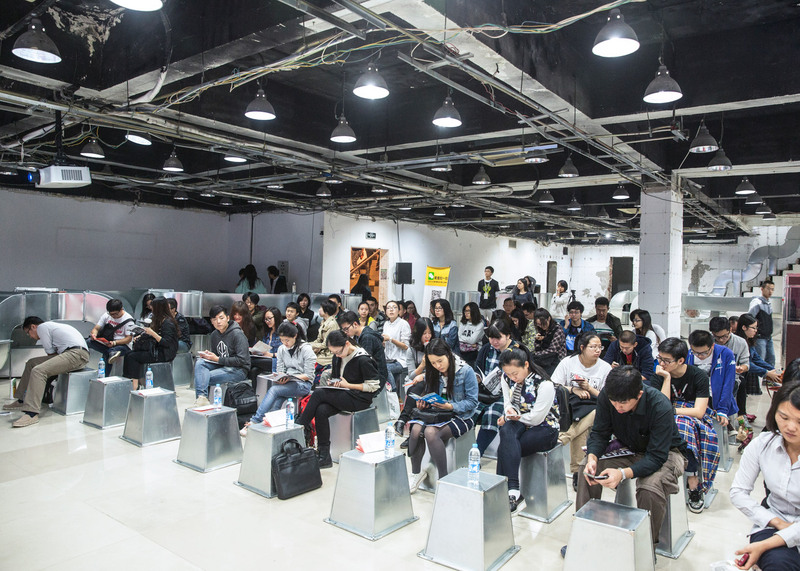 Beijing Design Week ran from 24 September until 1 October. 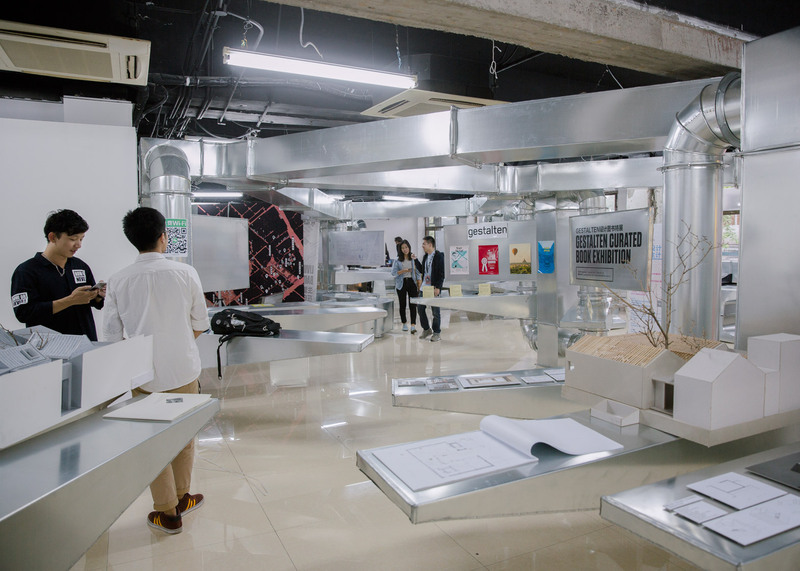 In a previous edition, People's Architecture Office developed a panelling system that could be used to build temporary living spaces within the ageing structures of the city's hutong districts. 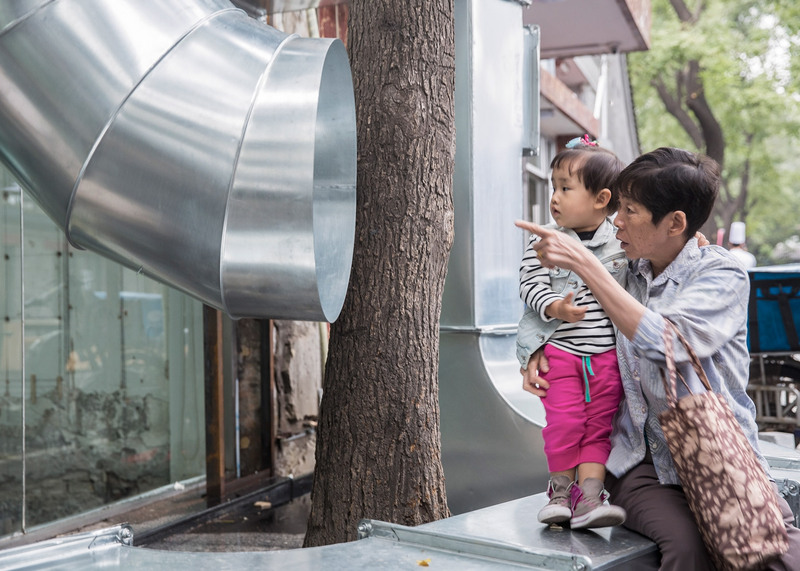 Other architectural practices have also proposed alternatives for Beijing's ancient houses, with local firm ReMIX Studio transforming a traditional residence in the Dashilar area into its own office, and Arch Studio redeveloping a derelict building into a tea house. 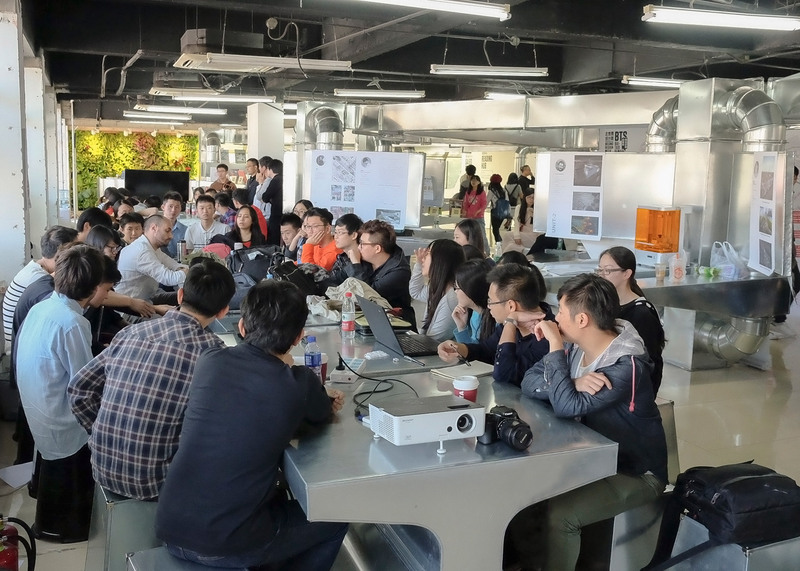 Photography is by People's Architecture Office and Liqun Zhao.